Scouting for my new YogaBerlin map, I got interested in yoga quit a bit and as I am currently working on a BertaHamburg map, I also found many yoga studios in Hamburg and many different types of yoga. Here are my Top yoga experience of the last few weeks! 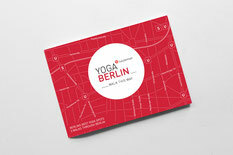 In case you need a good overview of yoga studios in Berlin, my YogaBerlin map can help you out. More info can be found here. 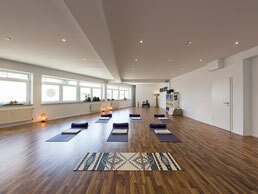 This is the first Hot Yoga studio for Hamburg's North and surroundings. All classes are designed for 60 minutes of Hot Yoga and consist of a sequence of 16 yoga exercises including 2 breathing exercises. For those who love Bikram Yoga but often find 90 minutes too much. Members may also use a sauna. Everything is more relaxed on the water, that's what Hamburger know best. Many outdoor yoga classes in Hamburg are offered here, especially in summer. We recommend the 'Stegyoga classes', which take place on a jetty at the Alster. 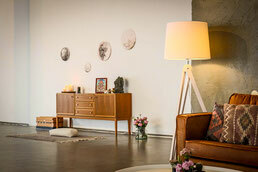 The concept of this yoga studio combines yoga with art, yoga workshops and yoga classes are host in an art room with a cool flair. In summer, outdoor yoga classes are offered three times a week at the Alster "Alsteryoga". The idea is to practice yoga in places that everyone loves, e. g. in cafés, parks, by the water, etc. 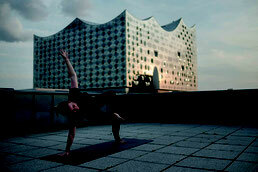 This summer they offen 'yoga with a view', like yoga on the rooftop of Hafencity. Yoga and live music = a combination that touches. Head off and follow the beat of the heart, that's Jennis' mission. 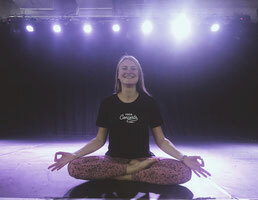 The concept of Yoga Concerts is a series of yoga events. I.e. there is no fixed place, studio or similar and therefore no fixed day or music style. Every Yoga Concert has a new sound, a new location and also a new day. Why roll out the mat? Because – a regular practice can help to develop a completely new body awareness and a healthy lifestyle. The physical benefits of yoga are numerous, the mental and spiritual ones even more. With Nadine, Fabienne and the others of this team you get to practice dynamic Vinyasa Flow, accurate Alignement Yoga, super relaxing Yin Yoga up to ‚Mum To Be'–Yoga for pregnant yoginis. This is biggest Bikram yoga studio in Hamburg. They offer classical Bikram Yoga – 26 exercises in 90 minutes. Bikram's beginning yoga class is a demanding series of 26 hatha yoga postures, which is suitable for all ages and levels of ability. The class lasts 90 minutes and is performed in a room heated to 40°C. The series is specifically designed to work every muscle, bone, joint, ligament, tendon, gland & organ in the body. In the same building is the largest martial arts school in Northern Germany (Zanshin Dojo) with several thousand members. The studio offers very spiritual Power Yoga. The classes always have a special motto like 'humility', 'mindfulness' and the teachers accompany you with little stories and wisdom. For people who want to experience yoga classically (India-like), this is the perfect studio! This summer they also practice some yoga classes at the Hohenbuchenpark. It is the center for AcroYoga in Hamburg, in Germany, in Europe. Here, AcroYoga is understood as: Partner acrobatics plus Therapeutic Flying plus Thai yoga massage -- all connected by the wisdom of yoga. Find classes, jams, small to weekend to international workshops, even trainings and travels. Find supplemental concerts, ceremonies, kalari, and much more. Here Dörte Kuhn offers XXL yoga for curvy yogis. She practice Pilates, Yoga, Yin Yoga, Yoga Therapy and Yoga PT's for overweight people. On the website you can also find an online shop with yogawear – Dicke Deern Shop. If you want to find hidden gems of Berlin, check out my folding maps BertaBerlin and QueerBerlin. They are available in well-chosen locations all over Charlottenburg, Neukölln, Kreuzberg, Mitte and Prenzlauer Berg in Berlin and online. But for those of you, who want to stay up to date, feel free to follow me on INSTAGRAM, FACEBOOK or register for my NEWSLETTER BertaNews. Thank you to my dear co-writer Paulina Czujko, who helped me scouting and writing this piece! She is the Hamburg expert, as she lived in Hamburg as a teenager and graduated there. I met her in Berlin on one of my KiezWalks, because she studied Nutritional Sciences here, but in September she will be my base in Hamburg and open the Hot Yoga Studio 'Hot Yoga Norderstedt'. to the newsletter for more exclusive Berlin recommendations! What to do in Prenzlauer Berg? It takes a lot of time to discover all the highlights Berlin has to offer, but here you have my Top 5 spots of Prenzlauer Berg. If you want to find more hidden gems of the German capital, pick a map about Prenzlauer Berg in my shop.